Solar panel production generates potent greenhouse gas; animal tagging codes hacked by poachers. Some intriguing reports have recently been published, which highlight the nature of unintended consequences that are often associated with environmental protection do-gooderism. We have regaled readers with the complete failure of Obama’s green energy programs, including the loss of hundreds of millions of tax-payer dollars when the lights went out on the now infamous Solyndra. Under Obama, solar energy was promoted as the best, most practical solution to preventing the release of green-house gases such as carbon dioxide. A federal report just released by the Environmental Protection Agency shows the production of solar panels has led to a substantial increase in in a compound that is 17,200 more potent as a greenhouse gas than CO2. An analysis of the report by Seeker contributor Greg Walters indicates that there is reason to be concerned. The gas, nitrogen trifluoride, or NF3, is a key chemical agent used to manufacture certain types of photovoltaic cells for solar panels, as well as semiconductors and LCD flat screens. NF3 is produced in minuscule quantities compared to carbon dioxide and now adds only a wafer-thin margin to America’s total greenhouse gas emissions, while carbon dioxide makes up 82 percent and methane nearly another 10 percent. But researchers warn NF3 is dangerous due to its devilish efficiency in trapping energy, and long atmospheric lifespan of up to 740 years. …The 1,057 percent increase in US annual emissions of NF3 from 1990 to 2015 compares to an increase of 5.6 percent in carbon dioxide emissions, according to EPA data in a recently-published draft of a new report, Inventory of U.S. Greenhouse Gas Emissions and Sinks: 1990-2015. The report said overall emissions fell 2.2 percent in 2015 as the country continued to swap coal for natural gas and a warmer winter reduced demand for heating fuel. Is the release of this report, shortly after the installation of Scott Pruitt as head of the EPA, coincidental? It certainly ties into the move to decriminalizing the use and production of fossil fuels in this country that is being promoted by the Trump administration. Eco-activists recently were warning that the Earth is about to undergo its 6th mass extinction event because of man-caused global warming. Yet, tracking devices for the “protection” of animals is now being used by poachers. These are just two cases of many showing that eco-activism and climate alarmism can be toxic, because they are not based on either science or reality. If you first posit that these things are not about the environment at all but instead about increased government power, then the unintended consequences make more sense. Because they really don’t care the environments not what it’s about. I agree. It has always been about power and money (except to the useful idiots). If greenhouse gases increase or animals die off, this will be used as an argument for more power and more money because the problem is getting worse. I do not think these are unintended consequences by those in control. Harm is always of use to a leftist. 1. Without greenhouse gases there would be no life on earth. 2. Every single breath that every animal on earth – including man – takes exhales carbon dioxide. CO2 is the byproduct of respiration. Regulating CO2 holds the very real possibility of placing limits on human life, as in you’ve produced your fair share of CO2, time for you to go. I agree. But, if you look at the process rather than the substance, what they say & do makes sense. It furthers the agenda of the left. They want use paying attention to the substance as it is only a means to the end. Granny: 1. Without greenhouse gases there would be no life on earth. Granny: 2. Every single breath that every animal on earth – including man – takes exhales carbon dioxide. CO2 is the byproduct of respiration. Regulating CO2 holds the very real possibility of placing limits on human life, as in you’ve produced your fair share of CO2, time for you to go. Animal respiration is carbon-neutral. The carbon you exhale was recently fixed by plants from atmospheric carbon. The historical record clearly shows warmer temperatures produce far less turmoil and death than colder temperatures. The Earth has had far more CO2 in its’ atmosphere in the past, before any possible anthropogenic effect. What is the ideal level of CO2 for human life, and how was that arrived at? Show all data and calculations. Likewise, temperatures have been warmer. What is the ideal temperature for human life, and how was that arrived at? Show all data and calculations. Otherwise, you are simply a cultist. SDN: The historical record clearly shows warmer temperatures produce far less turmoil and death than colder temperatures. Warmer temperatures within the last 10,000 years have been beneficial for the growth of civilization. However, global warming is projected to far exceed those temperatures, causing widespread disruption of agriculture, significant damage to ecosystems, and inundation of highly-populated coastlines. SDN: The Earth has had far more CO2 in its’ atmosphere in the past, before any possible anthropogenic effect. Sure. There are many factors which affect climate, including solar irradiance, volcanism, orbital variations, continental drift, albedo, mountain building, variations in sea currents, changes in greenhouse gases, even cometary impacts. So, while greenhouse gases tend to warm the climate, change in the Earth’s orbit may still result in a cooler climate. It’s the interrelationship of all these factors which determine climate. SDN: What is the ideal level of CO2 for human life, and how was that arrived at? Relative stability is most salubrious for human civilization. That’s because humans are settled into large population centers, with millions along coastlines subject to inundation, dependent on reliable weather for agriculture. In addition, rapid climate change will result in mass extinction, meaning much of humanity’s natural inheritance is at risk. Not sure what you mean by “carbon-neutral”. If you have a population of say, 100 CO2 exhaling lifeforms, they will, throughout their lifetimes, produce X CO2. Increase that population size to 100 million, and it will produce 100 million X CO2. Do you somehow believe that and the end of a lifeform’s existence, it re-absorbs all of the CO2 that it emitted over it’s lifetime of respiration? jhkrischel: Not sure what you mean by “carbon-neutral”. Carbon-neural means no *net* change in carbon dioxide in the atmosphere. jhkrischel: If you have a population of say, 100 CO2 exhaling lifeforms, they will, throughout their lifetimes, produce X CO2. Increase that population size to 100 million, and it will produce 100 million X CO2. All the carbon you exhale you consumed in the form of other organisms, either plant or animal. Take bread, for instance. The wheat plant absorbed CO2 from the atmosphere, combined it with water and energy from the sun to make carbohydrates (primarily in the form of starch). You consumed the wheat, then through the process of metabolism, released the stored energy in the carbohydrates, exhaling the water and CO2. There is no *net* change in atmospheric CO2. You exhale no more carbon than you consume, and that carbon was extracted from the atmosphere by the wheat. The difference is that, with humans, they are rapidly combusting carbon in the form of fossil fuels, which has been sequestered in the ground for millions of years, resulting in a *net* increase in atmospheric CO2. 3) slips – tried to do it right but accidentally did it wrong. A slip occurs when I misspell a word. Ignorance will be corrected if one considers reality or science. This might be the cure for the useful idiots. The leaders and those gaining power or money know that what they say and do is wrong. Education will not fix them. Punishment might correct some. The “dumbing down” of the education system is to make more useful idiots. “Eco-activism and climate alarmism” are based on violations of ethic principles. These people know it is not about science or reality. Just listen to their illogical assertions and rhetorical methods. Do not give them a pass. The dumbing down of the education system is not to simply produce useful idiots. What our education system is producing are SLAVES, ones without the capacity to think for themselves, to criticize, to even understand what the Constitution and the Bill of Rights actually means. They are being raised to think that Freedom of Speech applies only to speech that the “majority” agree with, that there are no rights to self defense, no freedom from illegal search and siezure. SLAVES – in a way that mankind has never seen slavery. They are also learning that broad areas of life are closed to inquiry or discussion. There is only one acceptable opinion about so many things, and woe to you if you don’t fall in line. “We will not tolerate intolerance!” is the way my son summarized one of his indoctrination sessions. So, does this explain why former EPA Administrator Lisa Jackson went to Apple ? Being that CO2 is a plant food and if the current CO2 levels of around 400 ppm were reduced to 200 ppm most plants would die with an associated cessation of O2 production and being that CO2 only accounts for 4-5% of the global warming effect (with water vapor accounting for nearly 95% of the effect), how can it be justified that CO2 is classified as a pollutant? Cleetus: CO2 only accounts for 4-5% of the global warming effect (with water vapor accounting for nearly 95% of the effect), how can it be justified that CO2 is classified as a pollutant? The total greenhouse effect is about 33°C. So 5% of that is still 1.5°C. CO2 is closer to 10-20% of the greenhouse effect. See Kiehl & Trenberth, Earth’s Annual Global Mean Energy Budget, Bulletin of the American Meteorological Society 1997. Calculations show that a doubling of CO2 will have the direct effect of raising Earth’s surface temperature by about 1°C. As warmer air can hold more water vapor, this will amplify the effect of CO2. This relationship is called climate sensitivity. Various measures of climate sensitivity put this value at 2-5°C. The left expects that vast quantity of solar panels, wind turbines, and storage batteries needed to re-tool our energy system will arrive carbon free on the backs environmentally friendly winged unicorns. The machines used to mine the ores that are used to make your turbines, plus the infrastructure required to make those machines. And the environmental impact of the mines themselves. The trucks/trains used to transport the ore to the refinery, plus the infrastructure required to make, maintain and operate those vehicles and the roads/rails they use. Oh, and the land that these road/rails stand on. The refineries themselves, plus the etc. I have never, NEVER, had an environmentalist even bother to reply, much less justify their position. Rusty Bill: I have never, NEVER, had an environmentalist even bother to reply, much less justify their position. Why don’t we ask the endangered eagles chopped up in them about their impact. I am convinced that the poaching trade has always been driven by rich Asian men with wee little winkies. Confession: we installed solar panels last summer. Not to save the earth or ya-da-ya-da. Because the power company here is planning to raise rates astronomically in the next few years “to bring Utah in line with what the rest of the country is paying” – not because it is costing them more. Utah is way too far north for solar panels to be more than marginally useful, even if you have auto-track servomechanisms to keep the panels pointed directly at the sun for maximum performance. That is incorrect. Utah is one of the best locations in the U.S. for solar energy. Says the same people who fudge data on a routine basis. SND: Says the same people who fudge data on a routine basis. That’s funny. As if anyone who has been to Utah doesn’t know they have a lot of sunny days. This is actually instructive. 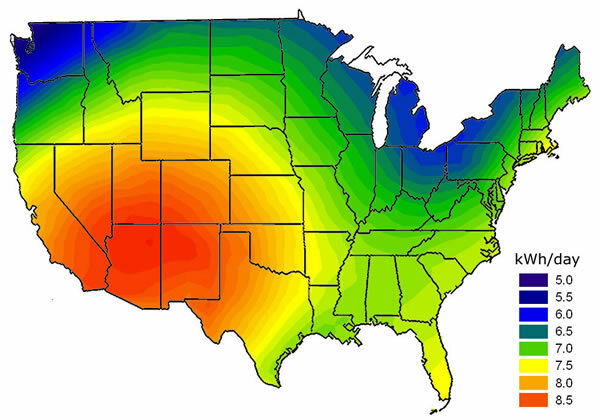 Many scientific findings can be easily replicated — including how much sun Utah receives.